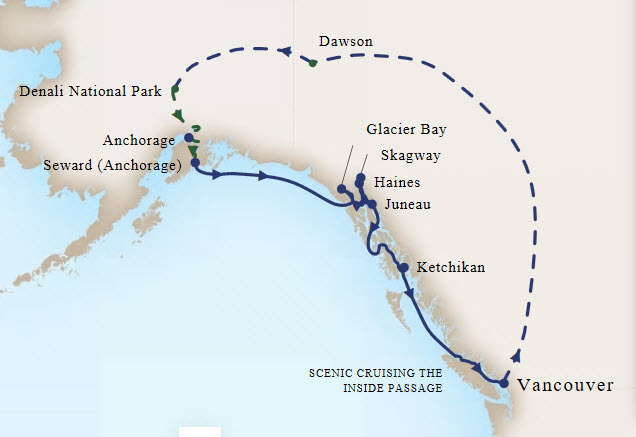 Holland America Line's iconic Alaska Cruises feature the famed Inside Passage and more options for visiting Glacier Bay National Park. If Denali is on your must-see list, choose this 14-Day Denali Land+Sea Journey (Tour Y2) that combines your cruise with the most immersive experiences at Denali National Park. From Vancouver, head to Dawson, Yukon before flying to Denali National Park for two days of exploration. Explore the beauty of Denali, on an included Tundra Wilderness Tour. Unwind in Holland America's own Denali Square. Relive Gold Rush history in the Yukon. Then take a bus and plane to Anchorage and board the elegant ms Noordam for your 10 day cruise. Sail through Glacier Bay, then visit Haines, Juneau, Ketchikan, and the iconic Inside Passage before returning to Vancouver. Book by Feb. 28 for a reduced deposit, stateroom upgrades, up to $1,000 air credit per stateroom, plus book a suite and receive up to $600 OBC! Denali is the iconic centerpiece of Alaska’s Interior and the #1 reason to combine a Holland America cruise to Alaska with an overland adventure. Only Holland America Line offers up to three nights in Denali to really settle in and explore, and is the only cruise line to include the deeper Tundra Wilderness Tour into Denali National Park on all of our two- and three-night Denali Land+Sea Journey itineraries. Immersing visitors in all that Denali has to offer is so important that we’ve created each of our Land+Sea Journeys to include up to three nights at Denali, at our beautiful 60-acre riverside McKinley Chalet Resort. Our new Denali Square at the McKinley Chalet Resort is the ultimate base camp for adventures to Denali, followed by relaxing evenings. Enjoy soaring views across the Nenana River into Denali National Park from virtually anywhere on this amazing property, as well as great dining, quality entertainment, and unique local shopping opportunities. Our exclusive longer stays, which include the Tundra Wilderness Tour, give our guests an up-close view of the mountain and the best wildlife viewing. It is rare not to see some combination of Alaska’s Big Five: grizzly bears, caribou, moose, Dall Sheep and wolves, along with other animals on this expertly guided six- to eight-hour tour. In addition, there are myriad once-in-a-lifetime adventures to choose from—such as river rafting, flightseeing (including the chance to land with a ski plane on Denali itself), or visiting the home of an Iditarod dog musher. With more than six million acres of pristine Alaska wilderness, Denali National Park with its abundant and easily viewable wildlife and North America’s tallest and most impressive peak will be sure to make your Land+Sea Journey experience one you’ve dreamed of. *Above prices are per person based on double occupancy, availability and subject to change without notice. Above fare does not include taxes, fees and port expenses up to $379 per person. Other restrictions may apply on above offer. Other Alaska Land+Sea Journeys available with this promotion. Offer is available for new bookings only. Promo NV2. Other restrictions apply.